"Loyalty and compassion cannot coexist." 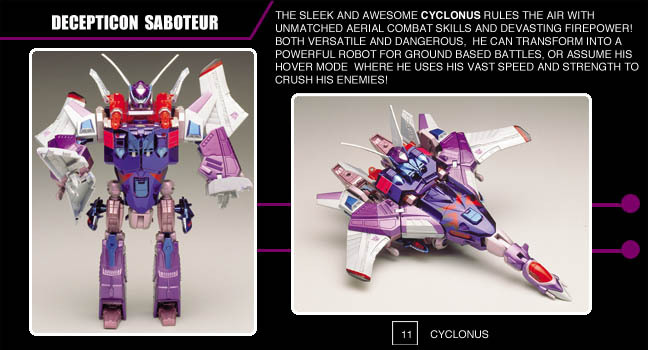 After exploiting Megatron's sinister to ensnare his Spark in a Vehicon body, Cyclonus escaped Cybertron in hopes of fulfilling his proud Decepticon heritage. Powerful, subtle, and loyal to the extreme. Capable of drawing strength from his enemies' attacks through bleedback receptors mounted in his fists. Highly maneuverable in jet mode due to dual fusion-powered engines and an advanced multi-wing design. In both modes, Cyclonus is armed with close-range oxidating pulse cannons and independently targetable incendiary missiles. Vulnerable only to leaders that would exploit his skills for their own evil purposes.